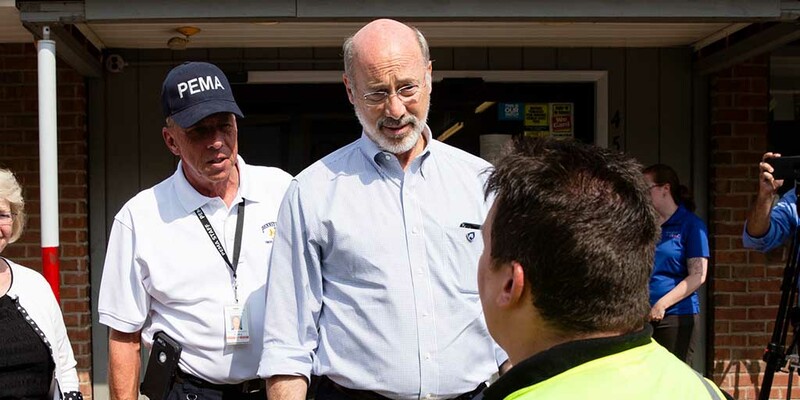 Harrisburg, PA – Governor Tom Wolf today announced that the U.S. Small Business Administration (SBA) approved his request to declare a disaster in Westmoreland County after significant flood damage to homes and businesses from a severe storm on Sept. 9, 2018. Homeowners, renters and businesses impacted by the storm in Westmoreland County, as well as neighboring counties Allegheny, Armstrong, Cambria, Fayette, Indiana, Somerset and Washington may be eligible for low-interest disaster loans through the SBA Disaster Loan Programs. Opening: Friday, October 12: 11 a.m.
– Monday – Friday: 9 a.m. – 6 p.m.
– Saturday, October 13: 10 a.m. – 2 p.m. Closing: Friday, October 19: 4 p.m.
Loan applications can also be downloaded at www.sba.gov/disaster. Applicants may apply online using the Electronic Loan Application (ELA) via the SBA’s secure website at https://disasterloan.sba.gov/ela. Completed applications should be returned to the DLOC or mailed to: U.S. Small Business Administration, Processing and Disbursement Center, 14925 Kingsport Road, Fort Worth, TX 76155. The filing deadline to return applications for physical property damage is Dec. 10, 2018. The deadline to return economic injury disaster loan applications is July 9, 2019.